Regensburg (Germany) June 2016. Scientists all over the world can now track the growth of mosquito populations on their computers. 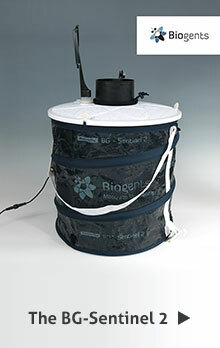 “The BG-Counter is a new kind of mosquito counting machine that allows scientists and health authorities to be proactive against a coming infestation,” says Dr Martin Geier of Biogents AG in Regensburg, Germany. The high-tech equipment was developed by the Regensburg mosquito experts in cooperation with a company from Silicon Valley and has been successfully tested since autumn 2015 in the Florida Keys on the southern tip of the Florida peninsula. The counter is now going into serial production. Recently, a demonstration model has come online at Lake Starnberg south of Munich. Since mid-June, it has been possible to track the increase in mosquito populations after the recent floods and even the times at which these insects are particularly active. BG-Counter in the field, with a screenshot of the catch data that can be viewed online. Last week, Microsoft announced that it was developing a similar mosquito trapping system, indicating that the demand for such intelligent mosquito traps is great and will continue to grow in the future. Globally, mosquitoes are considered among the creatures most dangerous to humans. Hundreds of thousands of people die each year from mosquito-borne diseases. Biogents AG, headquartered in the Bavarian city of Regensburg, has a prominent position in this promising market. For example, Biogents traps are considered the gold standard for Yellow Fever and Asian tiger mosquitoes around the world. No wonder since they are based on more than twenty years of intensive research and development. Whether the Microsoft traps will be comparable to those made by Biogents remains to be seen. “Microsoft wants to develop traps into some kind of flying laboratories that are supposed to solve every issue related to mosquito monitoring in one fell swoop. Our experience shows that it’s better to establish effective technologies step-by-step and integrate them over time,” says Dr Geier. Most importantly: before mosquitoes can be analysed and counted, they first must be attracted and trapped. When it comes to this essential detail, Biogents leads the field. Their particularly efficient traps are used by public health authorities and scientists worldwide. Even the US Centers for Disease Control and Prevention (CDC) recommends using Biogents’ BG-Sentinel traps as a monitoring tool in the fight against Asian tiger mosquitoes and Yellow Fever mosquitoes. Both these mosquitoes can also transmit Dengue, the Zika virus, and the Chikungunya viruses and are therefore considered to be particularly dangerous. According to the CDC, BG-Sentinel traps are currently the mosquito traps most commonly used to catch adult tiger mosquitoes. The field trials of the BG-Counter on the Florida Keys have been very successful. 80-90% of the trapped mosquitoes are correctly identified and counted. “Other mosquito-fighting organisations have indicated their interest in these new counters,” says Geier. Since February, Biogents has joined forces with Irideon SL in Spain and the Technological Educational Institute of Crete to further develop the BG-Counter’s sensors. The aim: to distinguish different mosquito species caught in the trap, and to identify those that are especially problematic as potential disease vectors. This project called REMOSIS (Remote Mosquito Situation and Identification System) is being funded by the EU’s Horizon 2020 programme. Researchers around the world will then be able to track carriers of disease and invasive species even more accurately than ever before. Cathrine Pruszynski of the Florida Keys Mosquito Control District (FKMCD) reviews the development and the first experiences with their tests of BG-Counters on the Florida Keys in her article “The BG-Counter – A new Surveillance Trap that Remotely Measures Mosquito Density in Real-Time”. Reference: Pruszynski C (2016) The BG-Counter: A New Surveillance Trap that Remotely Measures Mosquito Density in Real Time. Wing Beats 27:1, 13-18.